Over 200 residents of Birkdale have signed a Labour Party petition asking Santander to keep its branch in the village open. The branch is due to close on 19 November and Birkdale customers are not happy about it. Organised by the Birkdale Ward Labour Party, the petition was collected over five hours this week and was overwhelmingly backed by the public and businesses of Birkdale with almost everyone approached signing it. Birkdale resident and Labour Party Member Christine Goley, who organised the petition, said: “This will be the fourth bank branch to close in Birkdale in the last 18 months. “Lots of people are disgusted by the decision of the banks to close their branches in Birkdale Village. Some of the people who have signed the petition can’t get to the town centre because it is too far to walk or it is difficult to park. “We also had Birkdale Village shop owners who signed the petition as they use the branch to put cash in or take it out, and they also worry that less people will use their shops if they have to go into Southport to use the bank. 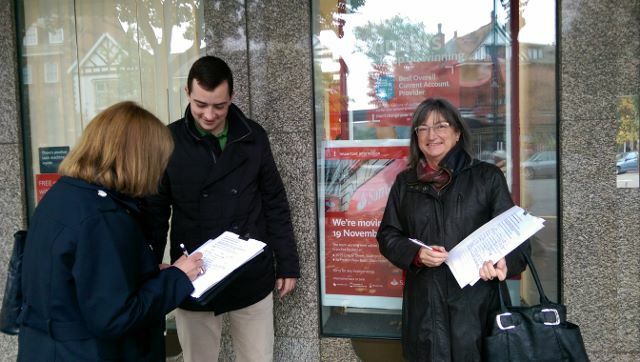 “Santander should think again, because its customers in Birkdale want to keep the branch open. It’s been good talking to people and getting their views. Some elderly and /or disabled people said they struggle to get to the banks in town because of the distance to walk or move a wheelchair from a car or taxi. HSBC in town doesn’t have a ramp. Workers at nearby Smedley Hydro use Birkdale banks at lunchtime because they don’t have enough time to get to town. Shops and bars said they are losing custom because people used to go to the bank then do some shopping and have a coffee. Local businesses also need coin transfer in or out, which is available at counters only. Previous Previous post: On the Up!